make your web site work for you! Not an InterNACHI member? No problem! We also build websites for ASHI, CREIA, NAHI and independent home inspectors. Your home inspection web site can be a valuable source of business leads, provided that your customers can find it online. 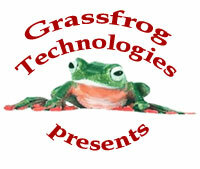 Grassfrog Technologies is more than just a web design and hosting company - we have specific expertise in search engine optimization and have successfully optimized websites for maximum results since 1996. Our methods have proven results, and we can help you to make your website the most effective marketing tool for your business! Our home inspection web sites are optimized for maximum search engine results, with streamlined code and built-in meta tags that can be edited to create titles and meta tags specific to your keyword and service area. Our Blue, Silver and Gold web sites comes with a built in content management system and an integrated links portal to make it easy for you to exchange links with other home inspectors and real estate web sites. Fast - get your website up and running quickly. Professional - professional designs and content written to give your customers the right impression about your business. Easy - prebuilt pages are there to get you started, which you can customize to your business as you wish. Our built-in content management system (CMS) makes it easy to edit your website at any time, without having to wait on someone else to do it for you. Our new CMS2 is supercharged to give you the best rankings on Google, with built in social networking buttons, persistent keyword content, and targeted content randomization to ensure that even stock pages are unique to the search engine bots. Affordable - plans to fit every budget and service level, starting at only $75 setup and $19.95 per month for our basic service. Save even more by signing up on an annual hosting plan! We also offer premium services, with custom design and web site content that is tailored to your business, we can write custom content for your website, and we also offer full search engine marketing support! Contact us for information on custom services for your site. Do you want to accept credit card payments on your website? We're here to help! Click the banner below to find out more about PayPal, or contact us about integrating a merchant account shopping cart on your website today. 33% of your setup fee is applicable to reduce the cost of upgrading to any other plan. 3 free email accounts ([email protected]) with autoresponders to allow you to manage your customer communications more effectively. Custom 404 handler to ensure your website never displays a broken link. Advanced content randomization tools to keep your content fresh for the search engines. full service SEO annual package, including keyword optimization and free quarterly submission of your entire site to over 800 search engines and directories. Price Reduced! Setup is now only $750 (one time fee). Hosting is $99.95 per month. *Template customization for Intermediate websites include selecting a background image to match your service area, and adding your logo and/or to your website template or home page and selecting a template which comes in a color that works with your logo. For custom website design see our Options page. Add SEO template integration, annual Search Engine Optimization, advanced statistics, up to 10 business email accounts, and double your monthly data transfer with this special package deal. See order page for details. copyright © 2003-2018 Grassfrog Technologies LLC. All rights reserved.